Mix and Chic: A client's family room project! 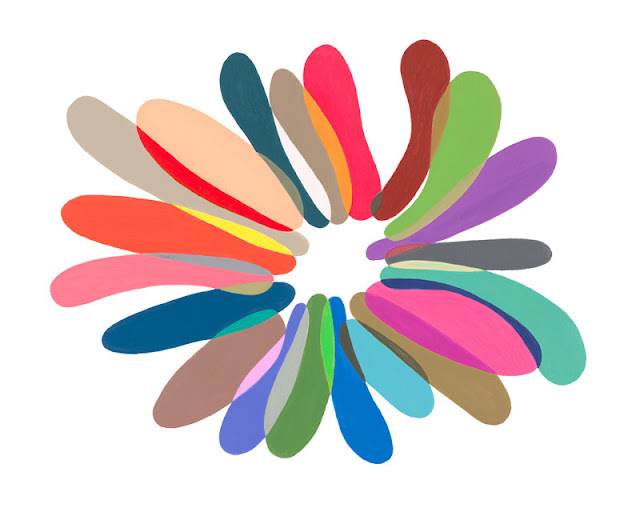 I have been quite busy helping two clients redesigning their spaces recently so I haven't been visiting and leave comments on all my favorite blogs. For that, I sincerely apologize. But don't think for a second that I have forgotten about you all because the truth is, I haven't. I will visit your blog as soon as I get a chance, I promise. 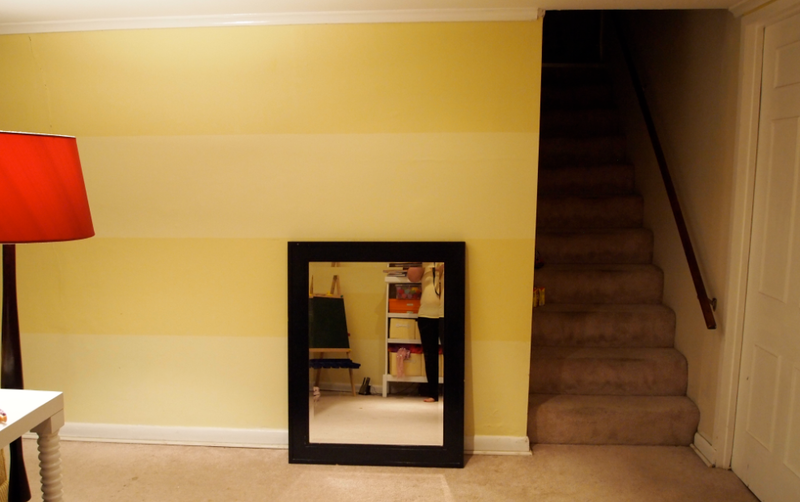 Today, I am going to share an online decorating project that I just wrapped up recently. 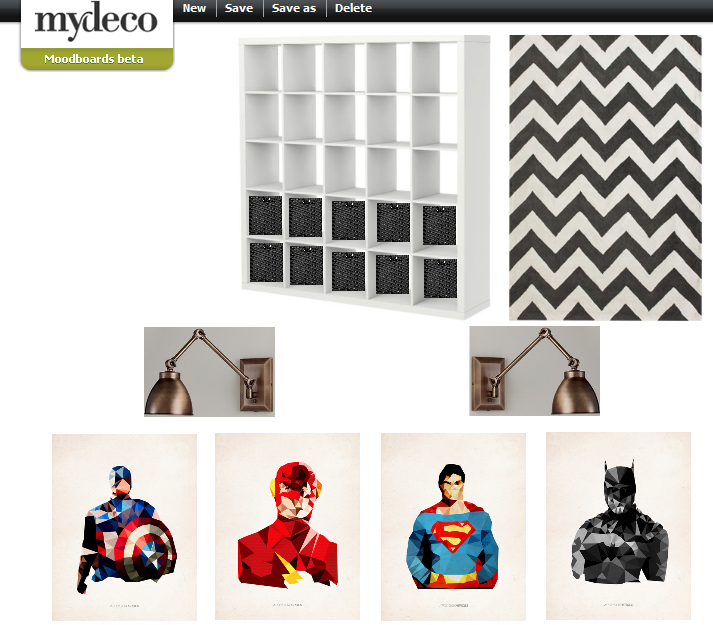 Remember the online room design giveaway I did during April, my birthday month? I had two winners and one of them is the lovely Elizabeth from The Little Black Door. 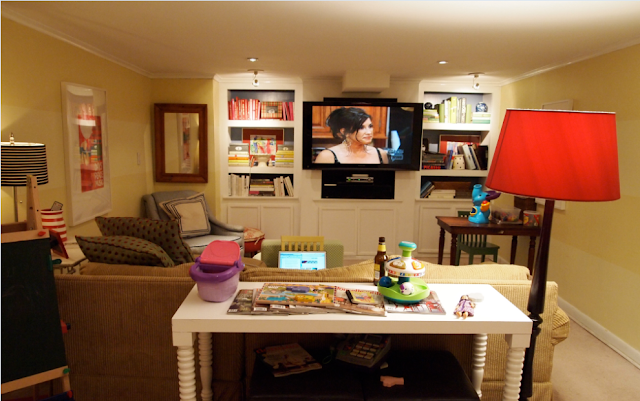 She needed help with her family room in the finished basement. Her spacious family room will need to do double duty; a place for her whole family to hang out to watch a movie, read and also a playroom for both her daughters. 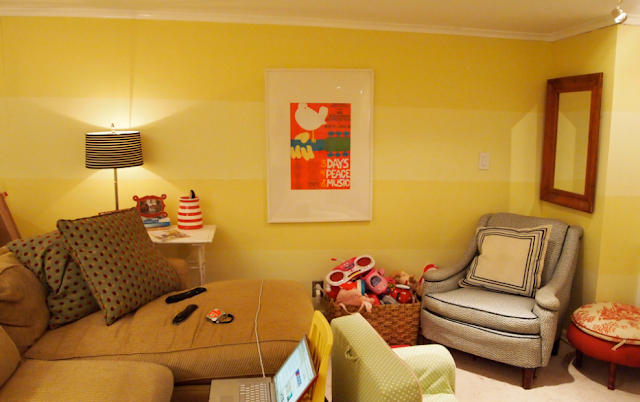 She wanted a design that is family friendly yet funky and doesn't scream playroom. Luckily for me, she has a realistic budget and she loves colors, patterns and lots of different textiles which is right up my design alley. Elizabeth's favorite color is green (Kelly especially), blue, black, gold, and particularly red, in every shades especially raspberry. Her style is a mix of traditional and transitional. In her questionnaire, she told me that she would love to get rid of the carpet one day and replaced it with laminate floors. She would also like to have more lighting and extra seating. Here is how her current family room looks like. 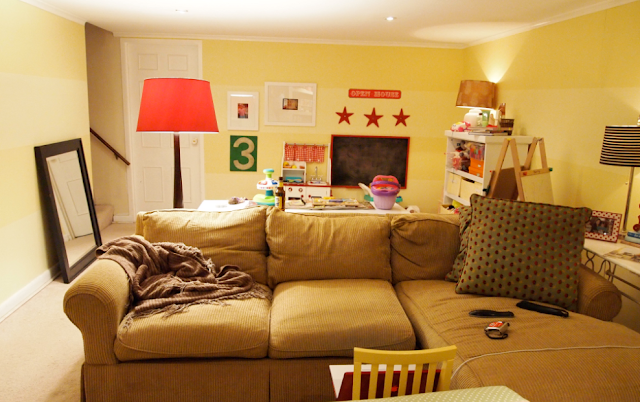 Her family room is very pretty from the start. Plus, it is bright, cheery and colorful. She also have a beautiful built-in that she built herself and a lot of other nice pieces. 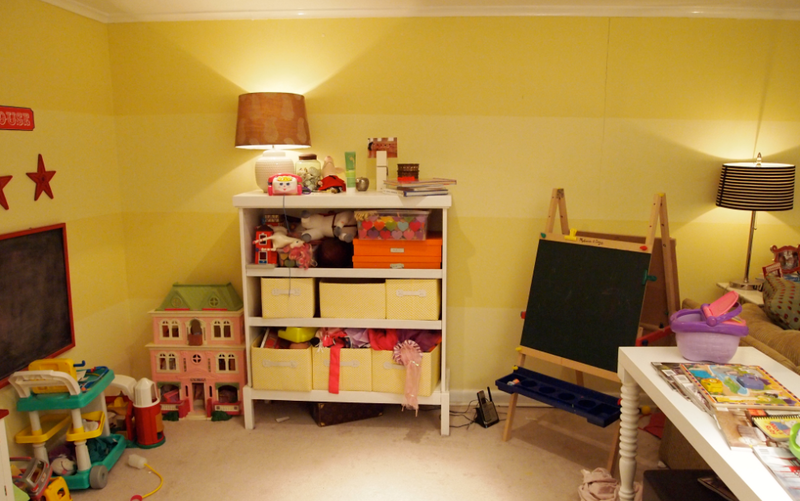 She wanted to spruce up the space and have storage for her daughters' toys. In her own words, everything can go except for the couch, tv and the armchair. This armchair that she salvaged needs to stay. She also intended to have it reupholstered some day. 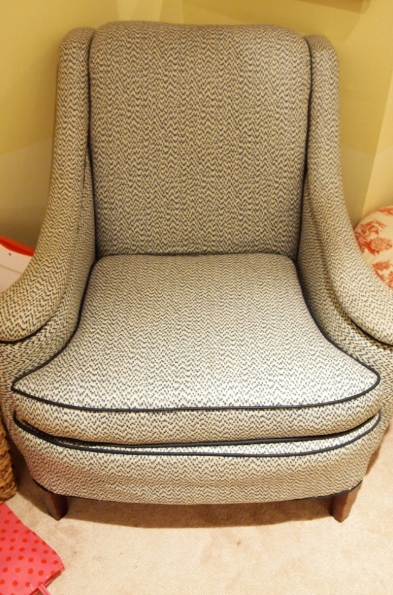 For her armchair, I selected the black polka dot fabric above after I had seen an inspiration picture that she showed me (where she loves everything in it) with a chair upholstered in a similar fabric. I knew I hit the upholstery fabric jackpot when I found the same fabric on an online discount fabric store. Moving on to her couch. At first, she wants the couch to stay but later, she changed her mind. With two young children at home, I suggested a faux leather sofa that has sleek, beautiful lines (the same sofa I had in my own home) so she can easily wipe spills away. In her photos, I noticed she didn't have a coffee table to put drinks on so I suggested a tufted ottoman considering the safety of her little ones and for extra seating. However, her husband is not a fan of tufted ottoman so I replaced the ottoman with a gorgeous rectangular glass coffee table instead. To provide extra seating for the small entertainment area, I wanted something that is backless, not bulky and seats at least two comfortably so I picked a modern leather bench that's inexpensive and practical for a family room. Elizabeth also told me she got tired of her old paint color and is ready for a change so I suggested a gorgeous light gray paint color (that I also have in my home). The console table she has now looks great so I suggested that she keeps it where it belongs now so she can put two new table lamps on it for extra lighting. 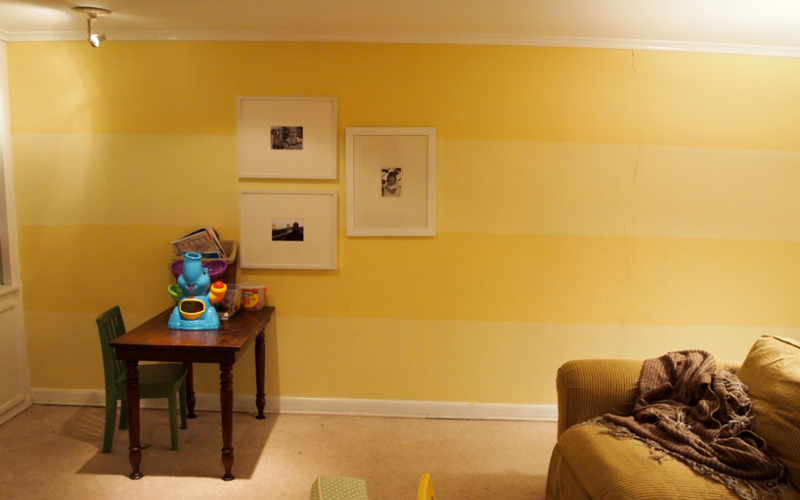 Because it's a basement, I really wanted her family room to be as bright as possible so I suggested mirror windows at one side of the wall. With these faux window mirrors, they also help to add some visual interest along the blank walls. Her budget only allows her to have two mirror windows but if she doesn't mind spending more down the road, do some DIY herself or perhaps found a less expensive option, I think having four mirror windows would be ideal. I also suggested these pretty bamboo fabrics for her curtains to compliment her faux windows. Because this is the room where her family always spend time in, I want it to look less like a basement and more like a regular family room that looks appealing at the same time. With that in mind, I suggested that she adds chair rail and wainscoting on all her walls for architectural interest. As for the play area, I suggested a large bookcase with storage baskets at the bottom shelves to store all her daughters' toys. As for the upper shelves, they can be used for books or display their favorite objects/ decorative items. The bookcase will be placed next to the door beside the staircase. To achieve visual balance, I suggested that Elizabeth moves her existing red floor lamp to the right side of the bookcase. The best thing about these artwork is the inexpensive price tag. They also come in several sizes so they can really pick what works best for their space and budget. Since I added a leather bench in her entertainment area, her existing writing table and chair will be a little overcrowded in the area. Thus, they will be relocated on the other side of the wall beside the open bookcase. Above the walls will be a pair of brass swing arm wall sconces to illuminate the fun artwork that will be hung above the desk. I suggested the desk to be painted a glossy white finish and the chair to be painted red/ coral, the same color as one of the red decorative pillows on the sofa. The easel will be moved next to the writing table. To pull the whole room together, I suggested that Elizabeth replaces the back of her bookshelves with a red/ coral color (the same color as her red pillow) instead of the blue she is currently having. 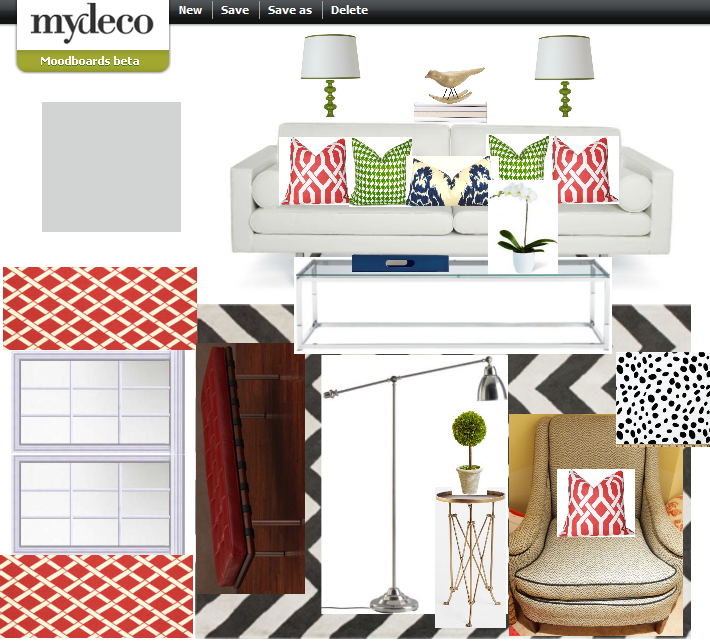 Both areas will have the same black and white chevron rug for cohesiveness. Elizabeth has already found an inexpensive blue ikat pillow that's very similar as the one in my design board. I haven't seen her new pillow yet but kudos to her for starting early and keeping her eyes open for similar pieces whenever she is out shopping. Smart lady! That is surely a great way to save money! I am looking forward to see our collaboration comes to life. Currently, Elizabeth is working on a few projects in her home but she promised to send me her family room's pictures as soon she starts working on it. I am sure you are excited to see the end result of this design project too so I will definitely share any progress or updates from her as soon as I can. I love the Superhero artwork! Thinking it would be a great gift for someone I know! Can you share the source? Great ideas...I love the mirror windows. Elizabeth can upholster that chair, herself. Did you see the sofa she did? This is fun, I can't wait to see how she interprets the superhero art. It seems like a lot of work Jessie! I love the artwork you suggested! 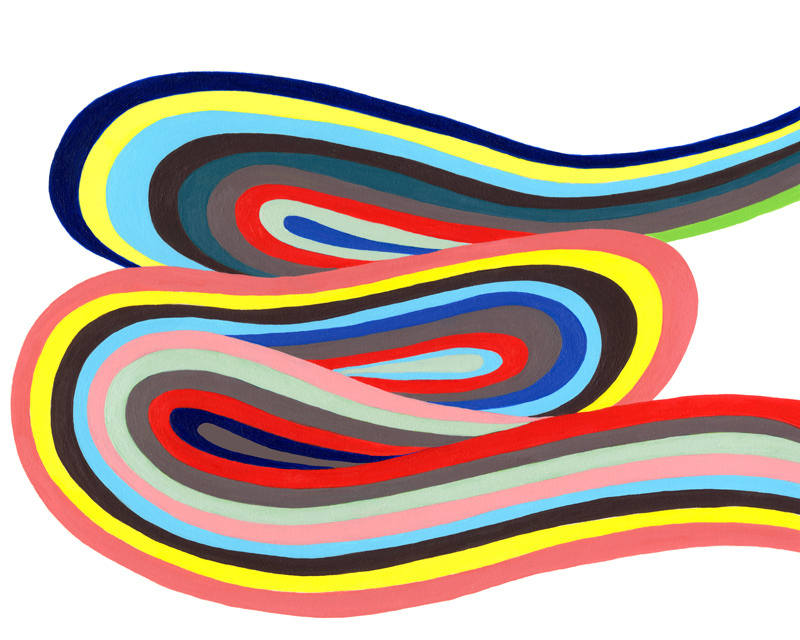 Could you possibly give us the link for this artwork? Thanks for the mention Jessie. You were great to work with! :) Too bad I didn't clean the room before I sent the 'before' pics. LOL. Can't wait to show you my progress. No apologies needed lady! Happy to see you're busy and that business is booming. I'm usually not a fan of green, but I gotta say I'm loving the sofa, the lamps and that black and white polka dot fabric. Good stuff! That is going to be one cute family room!!! I love the mirrored windows idea and all the pops of red. Great job! Look forward to seeing the photos with all the new changes. Nice job, Jessie. Love the fabrics and color. Can't wait to see the reveal! I love that chair! And actually, I love the current fabric - any idea what kind it is? I am so behind!! Can't believe I am just now reading this. I LOVE your ideas for her room Jessie!! The mirror windows are absolutely genius. I have never thought of that for a basement but it is brilliant. And the art work is so perfect for a family/playroom- it's bright and fun for kids, while still being cool and funky for adults. Love it all!!! You're amazing!! !